The Buzz on Urban Beekeeping! A quick-growing ground cover that produces small thimble-sized berries that are sweet and bountiful. Flowers and fruit form throughout the spring and into the late fall. Heaviest yield is during the mid summer months. Grows best when grown in sunny location with dappled shade and well draining soil. Will tolerate shade and moist soil conditions but won't produce as much fruit. Plants generally stand erect which helps protect the fruit from ground dwelling insects. Also grows well in hanging baskets. A very distinct BC Coastal evergreen tree with large glossy leaves and beautiful reddish bark that peels off in thin sheets. Requires very well drained slightly alkaline soil. Performs best in rocky soil with minimal organic content. Once planted it does not transplant well – choose site carefully. Drought tolerant - only limited watering required once established. Produces limited amounts of fragrant white flowers followed by clusters of orange/red berries. Very hard wood. * trees are slower growers, and can grow much larger in nature but rarely larger in an urban setting. Highly ornamental - beautiful spring flowering bulb. Grows well in a variety of conditions but does best in organically rich and acidic soils that are moist in the winter and spring but dry during the summer months. The bulbs were harvested and pit-roasted or boiled by various First Nations people. Always ensure proper identification before eating. Similar looking toxic species exist. A beautiful, easy to maintain, fast growing shrub that produces creamy white flowers that are edible, followed by dark blue berries. The berries are great for jams and jellies or making my Grandma's famous elderberry wine. Always cook before consumption, fresh berries have a bitter taste and can cause nausea. Plant in acidic, well drained moist soil with plenty of organic material – produces best in the full sun but grows well in partial shade, although it doesn't produce as much. Easy to maintain in tree like form or shrub with pruning. Semi-evergreen fern from Asia that changes colour from green to auburn in cooler weather. Grows in full and partial shade in organically rich acid soil. Prefers moist soil. Hardy evergreen fern. Great for the landscape. Grows in best in full to partial shade in organically rich, acidic soil. Does best in moist conditions but will tolerate some drought once established. Cut back in early spring to stimulate new years growth. Hardy evergreen fern – great for planting in hanging baskets. Grows naturally on moss covered rocks and trees. Plant in acidic loamy soil in full to partial shade. Plants require minimal soil depth and are becoming very popular in living walls. Roots have light licorice flavor and smell, used by some aboriginal groups in teas to help sooth stomack pains. A truly elegant and graceful deciduous fern. Tender green frons atop of purple - black wiry stems. Grows best in full shade in organically rich, acidic soil. Cut back in late fall or early spring as foliage dies back. Fiddle heads anyone? While first nations groups ate various ferns, it is the Ostrich fern that produces the tasty fiddle heads that are becoming increasingly popular in local farmers markets. Like most ferns it prefers partial shade or filtered sun and does best in rich acidic soil. The golden frons can reach up to 1.5m tall and therefore should be planted in an area that provides some protection from strong winds that can knock them down. The Ostrich fern is deciduous and needs to be cut back in the fall. Popular Pacific West Coast hardy evergreen fern. Long dark green fronds – great for understory shady plantings. Large size makes a dramatic statement in the landscape. Does best in moist acidic soil, rich in organic content but tolerates drought once established. One of the tastiest and attractive of all the Native huckleberry varieties. Black huckleberry are acidic-loving plants that grow best in partial shade in lightly moist soils. The bush produces beautiful pink flowers that are followed by the dark black berries in mid to late summer. The foliage is as great as the berries taste . First Nations peoples used them fresh and dried and they were a staple in many Coastal groups’ diets. Also known as Native Blueberry. Grows best in full sun but also performs well in light shade. Requires acidic soil with plenty of organic material to help maintain moisture. Branches have beautiful winter colour. Great tasting berries. One of the most popular of all the native berries. Like many, I have fond memories of picking them and eating them fresh or collecting them so my grandmother could make me huckleberry pancakes. They grow best in a filtered shade. The real key to their success is ensuring the soil is acidic with plenty of organic material to help maintain moisture. While the red huckleberry can tolerate some stress caused by drought, it perform best and rewards one with the heaviest crop if kept moist. A great evergreen landscape plant that can be used to create a hedge border or add evergreen colour to areas through the garden. New growth has bronzy red foliage that becomes quite dramatic during the winter. Thrives in moist acidic soil and does best in partial shade but also does well in sunnier areas. Produces edible dark purple berries in fall. Can be easily pruned to maintain desired shape. Spectacular blue to violet wild flower – flowers mid Spring through late summer. Produces ornamental pealike pods. Great for attracting birds, butterflies and bees to the garden. Grows well in full sun to partial shade and prefers well drained soil. This member of the legume family benefits the soil and plants growing in the vicinity with its nitrogen fixing abilities. Low growing evergreen native ground cover that does best in full sun to partial shade in well draining moist soil with plenty of organic material. Produces small light pink to white bell shaped flowers followed by red berries that are quite tart with a slight sweetness. Berries are great in jams and juiced but home gardens generally only produce enough to wet one's palate. Attractive Native tree that produces white to light pink flowers in the spring followed by cherry size red/yellow crabapples. Fruit is quite sour and while a food source of some First Nations Groups they are generally left on the tree to attract and feed birds. The thorny branching is great for creating secure habitat for birds. Grows in both full sun and partial shade – requires well draining slightly acidic organically rich soil. One of the first plants to flower out – clusters of pink to red flowers form in early spring before leaves even develop. Great at attracting butterflies and hummingbirds to the garden. They prefer well drained soil and full sun but can tolerate quite a variety of conditions. Can be left natural or pruned quite dramatically in the early spring or late fall depending upon your desire. Berries were eaten by some First Nations people but mainly as subsistence food as they are quite bitter. Hardy coastal evergreen. Grows in a variety of conditions from full sun to filtered shade. Tough foliage make it a great choice for low maintenance native plant gardens. Tolerates both dry and wet locations – it just needs pockets of acidic soil, rich in organic material. Growth is highly dependent on location – grows thick and lush in the understory but can stretch up to 3m in deep shade. Forms beautiful white/pink flowers flowed by edible purple berries that were a staple of many local aboriginals. Great eaten fresh or preserved in jellies and jams. The leaves were chewed as a hunger suppressant. Common greenery in floral arrangements. Saskatoon berries are high in antioxidants and a favourite for many people. Edible purple berries are lightly sweet with a nutty flavour. Great for jams, jellies and pies. This shrubby bush produces clusters of beautiful white flowers in spring, berries in the summer and adds fall colour to the garden. Plants thrive in full sun to partial shade and tolerate most soil conditions other than hard clays but do best in well-drained, rocky and slightly alkaline soil. 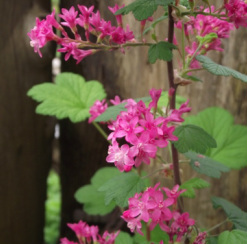 This beautiful non-edible native plant produces soft pinkish-purple heart-shaped flowers on soft ferny foliage in late spring/early summer and then tends to go dormant before emerging in the fall with a second lighter flush of flowers. Does well in both full and partial shade as long as the soil is lightly acidic, well drained and moist. British Columbia's provincial flower. Medium sized deciduous tree that produces beautiful greenish white flowers with purple tips in the spring. Does best in well drained soil with plenty of organic mater. Grows well in both partial shade and full sun. Once established only requires minimal watering. Aboriginal groups used the wood for bows, arrows and tools and medicinal uses. Wild Ginger is a great semi-evergreen perennial that does well with filtered sun and partial shade. It likes a moist, acidic soil that drains well and produces beautiful light purple flowers in May through June . Unfortunately the flowers are generally hidden under the lily pad green leaves. The plant has a nice spicy ginger-like scent when crushed. The roots can be eaten fresh or dried as a ginger substitute. First Nations peoples used it in medicinal teas to sooth stomach pains.